The year 2017 is packed with a bunch of successful Pakistani movies. Some of the Pakistani blockbuster movies are slated to release on Eid-ul-Fitr 2017. 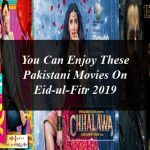 The Pakistani blockbuster movies will definitely through a tough competition to Bollywood and Hollywood movies in 2017 as these movies contains the veteran talented celebrities including Mahira Khan, Yasir Nawaz, Shaan Shahid, Danish Tamior, Ali Azmat, Bilal Ashraf, sheheryar munawar , humayun saeed, Mehwish Hayat , Sana Javed and Urwa Hocane. On of the Bollywood movie Tubelight is also slated to release on Eid worldwide but it will not be screened in Pakistani Cinemas.